1. Hypertrophic: Those growing inside the boundaries of the original wound. They often appear on flexion surfaces (abdomen) and practically always on tension zones. They appear after the operation. They disappear with compression therapy They tend to spontaneously improve over the time. 2. 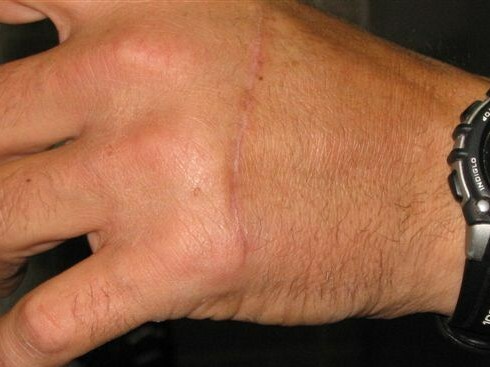 Contracture: An excessive contracture and a shape distortion occur. b) Synechiae: Laminar scarring (from chin to thorax). c) Ectropion: Periorificial scarring (from eyelid to mouth). 3. Depressed or Atrophic: They have a sunken appearance. Their appearance improves when stretching the skin (scars due to acne). 4. Discromic: Color alteration due to excess or defect. They are common on thick dark skins. 5. Alopecic: Appearing on scalp or eyebrows.